Finds a sparse representation of data against a fixed, precomputed dictionary. The dictionary atoms used for sparse coding. Lines are assumed to be normalized to unit norm. Number of nonzero coefficients to target in each column of the solution. This is only used by algorithm='lars' and algorithm='omp' and is overridden by alpha in the Orthogonal Matching Pursuit (OMP) case. If algorithm='lasso_lars' or algorithm='lasso_cd', alpha is the penalty applied to the L1 norm. If algorithm='threshold', alpha is the absolute value of the threshold below which coefficients will be squashed to zero. If algorithm='omp', alpha is the tolerance parameter: the value of the reconstruction error targeted. In this case, it overrides n_nonzero_coefs. Whether to split the sparse feature vector into the concatenation of its negative part and its positive part. This can improve the performance of downstream classifiers. Whether to enforce positivity when finding the code. 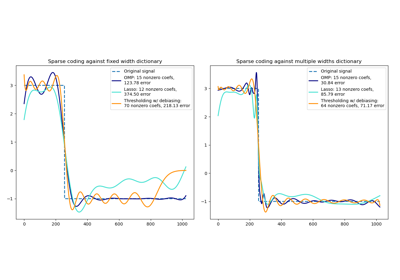 transform(X) Encode the data as a sparse combination of the dictionary atoms. This method is just there to implement the usual API and hence work in pipelines. Encode the data as a sparse combination of the dictionary atoms. Coding method is determined by the object parameter transform_algorithm.